At Viget, we believe in sharing. We share our ideas on our blogs, we share our knowledge at industry events, we share our entrepreneurial experiments via Pointless Corp, and we share our adventures in pictures and videos. 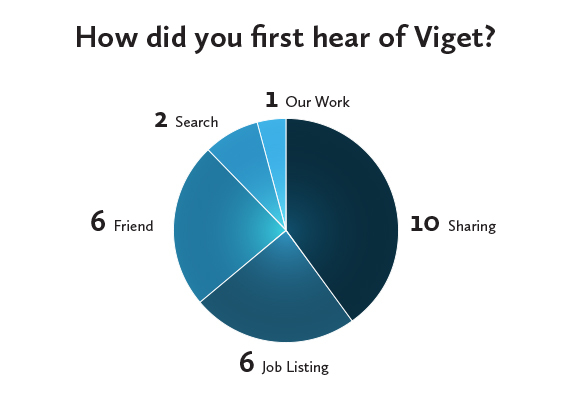 We've asked the last twenty-five people we've hired how they first heard of Viget. Ten of them referenced something I would categorize as sharing -- a blog post, our code on github, an application we built and made public, etc. About a quarter of recent applicants have mentioned their affinity for our Pointless Corp endeavors. This reveals that the candidate has done research into Viget and they've uncovered a small, quirky, but important aspect of our company. It's a short-cut to confirming culture fit -- a quick way to know that they care about something that's important to us. Is there a downside to so much sharing? Yes. I think sometimes we paint such a full picture of what it's like to work here, that applicants get ahead of themselves and imagine themselves fitting into that picture before we've had a chance to discuss skills, talents, and the actual job responsibilities. It can sometimes make evaluations and rejections that much more stressful and disappointing, I think. Is it hard to share so much? Not really. It comes naturally to many people here -- they love sharing what they're learning on the job and many of them are gifted writers and speakers. For others, it may take more work, but they believe it's worth the effort. Sharing is inherent to the Viget culture; it's not forced. Does Viget share everything? No, not with the whole world anyway. There is a lot going on here that only gets shared internally (via basecamp, campfire, and yammer, mostly). And I have conversations all the time with coworkers where I'm surprised to hear some details about what they're doing. Should applicants share a lot, too? I think so. When candidates are active on github, dribbble, twitter, or their own site it helps us determine if their skills and interests are relevant. When they are, we get excited (and, of course, prepare to get to know them much better). We still look at resumes and cover emails. I will still dig you up on LinkedIn. But when you share what you're learning, making, and experimenting with, we have such a better idea of what it might be like to work with you. And I think by hiring people for whom this comes naturally, we continue to nurture the Viget culture of sharing. Is this blog post sharing thoughts about sharing? Yes, yes. Very meta. Want to share with us? We're hiring!